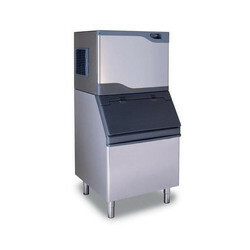 We are a leading Authorized Wholesale Dealer of ice machines from Chennai, India. With our immense domain expertise, we are involved in offering Ice Machines that are mainly preferred for water content control. These machines are manufactured using supreme class components and cutting edge technology at vendors' premises at par with international standards. Offered machines are well-equipped with power saving components and features energy saving design. Moreover, we offer these machines in diverse technical specifications as per the needs of the clients. Looking for Ice Machines ?